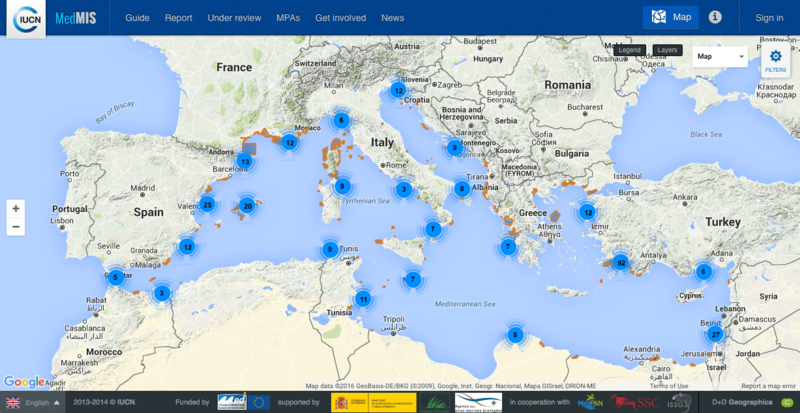 IUCN announces a new App for detecting marine invasive species in Mediterranean Marine Protected Areas. Did you know that invasive species are one of the greatest threats to the biodiversity of both Marine Protected Areas (MPAs) and the Mediterranean Sea? There is a need to detected these species in time, to control them and to reduce their impact. You can help by reporting your sightings by using a new Smartphone’s application developed by IUCN. Your information will be will be given directly to the manager body of the closest MPA. The IUCN Centre for Mediterranean Cooperation invites amateur or professional divers, marine technicians, MPA managers, fishermen or scientists to download and use a new app for identifying potentially invasive species in Marine Protected Areas (MPAs) in the Mediterranean Sea. This new application can be downloaded on smartphones. An online platform supports the app, by providing an identification guide of the most important invasive species found in the Mediterranean Sea. Once you identify a potentially invasive species you can report via the app. All reported data will be verified before display on an online map, which is accessible through an online platform. Especially, the Mediterranean Sea is being considered as one of the main hotspots of marine bioinvasions and it shows increasing rates of introductions. Once an invasive species has been introduced and has establish viable populations it can expand into previously uncolonized areas in the Mediterranean Sea. These species are capable of damaging the environment, the economy, or human health. In the the Mediterranean, very well know examples for damaging the environment, the economy, or human health are species such as the highly invasive algae Caulerpa racemosa or Caulerpa taxifolia, or the poisonous fishes such as the Lagocephalus sceleratus. This new IUCN app enables collecting information into one database. All data will be online accessible for all those interested in receiving information on invasive species. More importantly, it will support conservation efforts through recording the presence of potentially invasive species and help MPAs managers to control the spread of invasive species in the Mediterranean Sea. Interested to support scientists in MPA manager in detecting marine invasive species ? Are you an amateur or professional divers, marine technicians, MPA managers, fishermen or scientists? Than you should download the new app! The Smartphone’s application is free and available in English, French and Spanish. You can download it here. STORY SOURCE: The above post is written based on materials provided by: IUCN and IUCN-MedMIS. Note: Materials may be edited for content and length.